Some data mining has uncovered a vault under Fortnite’s Loot Lake, which could be the game’s next big event. Following the recent appearance of excavators, game files seem to suggest a structure will slowly open up, revealing…something. The information has since been verified by Reddit’s u/fxck_itz_josh, who was able to clip through the map in replay mode to uncover the large structure. The image of the structure showcases a total of 12 sections but doesn’t give any indication of its contents. Twitter’s Lucas7yohsi and FortTory have also been on the case, uncovering additional meshes and strange runic symbols. Unfortunately, with additional references to snow meshes and other weird shapes floating around leakers are yet to figure out exactly what it means. However, from strings in the files, Lucas7yoshi guesses that there will be 5 warm-up events and three calendar events. There are definite mentions of an energy laser, but he believes this may be due to reused assets from the Thanos event. Loot Lake happens to be where the mysterious purple cube was laid to rest. Some players are reporting strange noises from the depths, repeating every 5 to 20 minutes. Others say they heard the strange noise before the v8.40 update that kicked all this off. There’s a good chance that it’ll be related to the cube somehow, but Epic is yet to speak up. As season eight comes to an end, it’s looking to grab players’ attention once more. If the past is any indicator, it’ll stay silent all the way through the event, letting the community raise hype as they go. 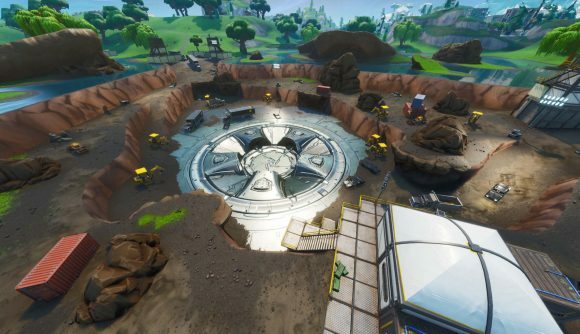 Either way, with excavators and a pirate anchor at Dusty Divot joined by construction near the desert biome, it’s bound to be a big one. It’ll be interesting to see if leakers can beat Epic to the punch, or if these are just confusing red herrings.